We love this vessel! It is very fine quality and was true to color. It went very well in our bathroom. Pattern was subtle, which we were pleased with. Blended nicely with other patterns in the bathroom. Santa Fe Ceramic Art Lombard Bathroom Vessel Vanity Sink - 15-3/4" O.D. X 5-3/4" D.
Santa Fe Ceramic Art Boreal Bathroom Vessel Vanity Sink - 16-1/2" O.D. 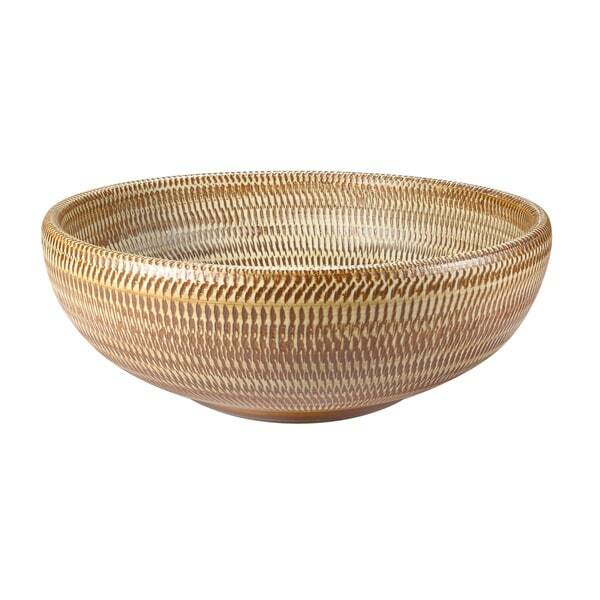 X 6" D.
This Santa Fe Ceramic Art Round Vessel Sink features a primitive patina woven basket portrayal. This sink measures 15-3/4" O.D. X 5-3/4" D.
Stunning, one-of-a-kind Santa Fe Ceramic Art vessel sinks work equally well in traditional or contemporary settings. The basket pattern was carried inside the bowl, as well as, outside. So, the bowl has a textured surface, which may require brush cleaning. We purchased 2 vessels: the color of 1 was very similar to the picture. However, the 2nd one was much lighter in color. There may be too much of a color difference if you use them together on 1 vanity.